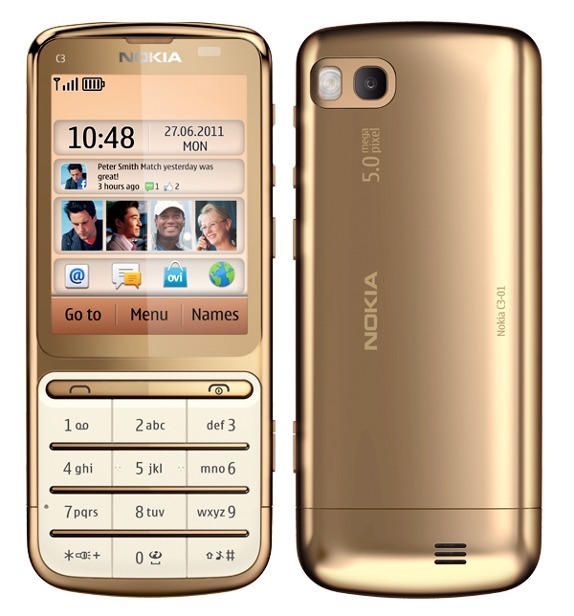 The Nokia C3-01 is basically a Touch-and-Type feature phone having a fancy 18 carat gold topcoat with ceramic-feel keymat and a matching Gold theme. The C3-01 features a 2.4-inch QVGA resistive touchscreen display with 240x320pixel resolution powered by 1GHz processor runs on Series 40 6th edition software. It sports a 5 megapixel rear camera with LED flash. Network options of Nokia C3-01 GE includes quadband GSM radio, HSDPA, WiFi, Bluetooth, and a microSD card slot with 32 GB expandable memory. Apps of Nokia C3-01 Gold includes Nokia Messaging for email and IM, Nokia Communities for Facebook and Twitter, the new Nokia S40 browser and the Ovi Store, obvi. The C3-01 has a dimension of 111x47x11mm and weighs 100gms. It comes with 1050mAh standard battery which provides 5.5 hours talk time and up to 18 days standby. The C3-01 Gold is available primarily in Eastern Europe and the Middle East for a price of €220 ($318). 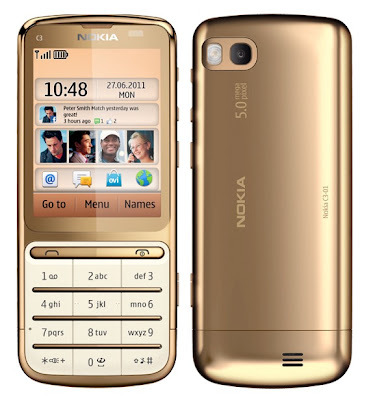 Tags: Nokia C3-01, Nokia Gold Edition smartphones, Nokia C3-01 GE, Series 40 nokia phone, Nokia C3-01 Gold Edition, Nokia C3-01 Gold Edition features, Nokia C3-01 Gold Edition specifications, Nokia C3-01 Gold Edition review, Nokia C3-01 Gold Edition details, Nokia C3-01 Gold Edition availability, Nokia C3-01 Gold Edition specs, Nokia C3-01 Gold Edition images, Nokia C3-01 Gold Edition pics, Nokia C3-01 Gold Edition pictures, Nokia C3-01 Gold Edition price, Nokia C3-01 Gold Edition imgs, Gold Edition, gold-plated, luxury, luxury phone, Series 40, Touch and Type.